We’d love your help. Let us know what’s wrong with this preview of Mama's Saris by Pooja Makhijani. To ask other readers questions about Mama's Saris, please sign up. Great book. It would be enjoyed by children in grades 2 through 4. Gorgeous illustrations highlight this heartwarming story about a mother and daughter who are getting dressed for the little girl's birthday party. The narrative is simple, although some of the names are a little hard. I appreciated the author's note at the beginning of the story as well as the Hindi pronunciation guide (I discovered that I'd said bindi and Diwali wrong all this time, using a "d" sound instead of a "th" sound.) I love the last page as the mother's and daughter's faces are next to Gorgeous illustrations highlight this heartwarming story about a mother and daughter who are getting dressed for the little girl's birthday party. The narrative is simple, although some of the names are a little hard. I appreciated the author's note at the beginning of the story as well as the Hindi pronunciation guide (I discovered that I'd said bindi and Diwali wrong all this time, using a "d" sound instead of a "th" sound.) I love the last page as the mother's and daughter's faces are next to each other and they look very much alike. People comment all the time that our girls look just like me and I love it. Our oldest read this book aloud to us and we really enjoyed reading it together. Many girls and mothers will enjoy this book. The young girl in the story admires her mother’s saris, traditional Indian dresses. Her mother has many saris in different styles, textures, and colors—each one has a different story. The mother only wears saris on special occasions and this adds to the girl’s admiration. In the story, it is the girl’s seventh birthday and she begs and pleads until her mother allows her to wear a sari to her birthday party. The bright, warm illustrations compliment th Many girls and mothers will enjoy this book. The young girl in the story admires her mother’s saris, traditional Indian dresses. Her mother has many saris in different styles, textures, and colors—each one has a different story. The mother only wears saris on special occasions and this adds to the girl’s admiration. In the story, it is the girl’s seventh birthday and she begs and pleads until her mother allows her to wear a sari to her birthday party. The bright, warm illustrations compliment the text and beautifully captures the dream of many young girls, to be dress and be like their mothers. For me personally, the insight into Indian culture was far more intriguing than the mother-daughter bond. I enjoyed the author’s note in the beginning that clarified the pronunciation of Hindi words found in the book and gave some background to the story. Many years ago, I had an Indian boyfriend and I loved exploring the Indian culture via pictures, movies, restaurants, and visiting a temple. I remember wanting to wear a sari back then…perhaps, I will someday. This story is set in an Indian culture and captures a girl’s desire to dress up in her mother’s beautiful saris and to feel grown-up. Being it is her daughter’s seventh birthday, the mother finally gives in and wraps her daughter in a traditional sari. The language and dialogue make it a believable story. It certainly has universal appeal. Gomez’s colorful paintings show the rich Indian culture, giving it a realistic touch. A young girl wonders why she can't wear a sari like her mother. Today is her birthday and she wants to look like a grown-up, even though she's only 7. She is mesmerized by her mother's saris as they come out of the suitcase they're kept in. All the colors! And each one marks a special occasion. Finally, her mother relents and let's her choose a beautiful blue and gold sari to wear for her birthday. She has to stand very still so her mother can wrap and wrap and fold the many yards of fabric in a A young girl wonders why she can't wear a sari like her mother. Today is her birthday and she wants to look like a grown-up, even though she's only 7. She is mesmerized by her mother's saris as they come out of the suitcase they're kept in. All the colors! And each one marks a special occasion. This story features an Indian-American girl (implicit) admiring and playing dress-up with her mother's saris. This is a lovely introduction to Indian clothing and traditions that would make any girl want a sari to dress up in. This was a beautiful story about a young girl watching her mother who desperately wants to wear a sari too. She remembers the special occasion when each sari was worn and manages to convince her mother to let her wear a sari for the first time. A beautiful story with beautiful/colorful illustrations. This tale first came to me in my early twenties. A young girl wants to celebrate her seventh birthday party in the finest style possible, and for her, this means the right to wear one of her mother’s intricate saris. As her mother produces the infrequently worn, much-treasured collection from its storage space beneath the bed, her daughter pleads, cajoles and sulks, seemingly to no avail. Each sari the mother holds up from the leather suitcase has its own story. The one she selects for herself to wear at her child’s birthday celebration is brilliantly orange, trimmed with a carmine hem, and it was also donned on the day she brought her infant daughter home for the first time. Others, in colours of ripe fruit; the ink-dark midnight sky; the wide, blue ocean, are paraded before the daughter, and finally, sensing the young girl’s urgency, the mother comes to a momentous decision that will frame the day in heightened significance for them both. Gomez’s art partners itself with Makhijani’s prose in an exquisite, sensorially aware marriage that is, simultaneously, rapturous to behold and arresting to read. Each page unfurls before us like a yard of ornately bedezined sari cloth, stitched with remarkable love, attention to detail, and master (mistress!) craftswomanship. ” ‘What about this one?’ I point to a sari that I don’t think I’ve seen before. It is orange like fire with edges that look like they have been dipped in red paint. ♣ anyone for whom the sari is a sublime expression of beauty and artistry. ♣ mother and daughter duos eager to infuse their lives—and dress up dates—with even more revelry! ♣ those who skip and lilt, exultantly, at the place where traditions are delicately and deliberately passed on, those torches that bloom through the years. I really enjoyed Mama's Saris. I was a bit confused at first but then when you keep reading and realize that a Sari is the outfits that they were on special occasions. The daughter is helping her Mom get ready for her birthday party. She helps her decide which Sari she is going to wear. Mama then starts looking through all of the Sari's she has worn over the years, and her daughter remembers each one for every occasion. The daughter asks since its her birthday if she could wear one for today. He I really enjoyed Mama's Saris. I was a bit confused at first but then when you keep reading and realize that a Sari is the outfits that they were on special occasions. The daughter is helping her Mom get ready for her birthday party. She helps her decide which Sari she is going to wear. Mama then starts looking through all of the Sari's she has worn over the years, and her daughter remembers each one for every occasion. The daughter asks since its her birthday if she could wear one for today. Her mother replies and says that Sari's are for grown up and she is still too little to wear them, maybe when she is a little bit older she can. After talking with her mother about it, she has been convinced and the daughter knows exactly which one she wants to wear. The blue one with gold flowers that dance along the bottom. Her mother then begins to pin it all together so its not too big. After looking in the mirror the little girl says "I think I look like you!" Mama's Saris by Pooja Makhijani, illustrated by Elena Gomez, is the story of a girl who wants to wear a sari for her seventh birthday so that she will look like her mother. Gomez' colorful, beautiful illustrations were done in acrylics. My favorite illustrations are cover, Grandmother, eggplant, galloping deer, and last two images. I appreciated that the author's note and pronunciation guide for seven words was at the front of the book, allowing readers to better read and understand the story. My Mama's Saris by Pooja Makhijani, illustrated by Elena Gomez, is the story of a girl who wants to wear a sari for her seventh birthday so that she will look like her mother. I appreciated that the author's note and pronunciation guide for seven words was at the front of the book, allowing readers to better read and understand the story. My main complaint is that the child looked a bit old to only be turning seven. The inclusion of culture into the book is smoothly done, while pointing out the culture blending of the family usually wearing Western clothing. This book could be used both for clothing and multicultural themes. Recommended for school and public library collections. This story was selected as one of the books for the May 2012 - Mothers reads at the Picture-Book Club in the Children's Books Group here at Goodreads. This nonfiction story was about a little girl fascinated with her mother's clothes. The mother cherished her little girl who couldn’t wait to grow up. The mother is getting dressed for the daughter's birthday party and she is wearing a Sari because she only wears them on special occasions. It is the daughter's 7th birthday and she would like to wear a Sari because she wanted to feel beautiful like her mommy. However, the mother did not think she was old enough. The daughter kept asking and askin This nonfiction story was about a little girl fascinated with her mother's clothes. The mother cherished her little girl who couldn’t wait to grow up. The mother is getting dressed for the daughter's birthday party and she is wearing a Sari because she only wears them on special occasions. It is the daughter's 7th birthday and she would like to wear a Sari because she wanted to feel beautiful like her mommy. However, the mother did not think she was old enough. The daughter kept asking and asking and finally the mother decided to let her wear one. I liked at the end of the story seeing the picture of the mother and daughter smiling and the daughter said, "I look just like you!" As a literacy teacher, I would use this story to embrace culture differences. The characters in this story are Indian. I could bring a satin scarf to represent a Sari and let all of the students touch it to see why the daughter was so eager to wear one. Pooja Nakhijani was born in New York but she is of Indian descent. The author does a great job portraying a mother and daughter's conversation. Seeing that this happens in most families regardless of race, this book is great for children. "Mama's saris' is a very interesting book which reminds most of the Indians about their festive season or their culture. This book can be used in elementary level for discussion about different types of clothes people wear in India and women wear sari's. The book is very colorful and has detail text which weaves you into the story. This story is about a young girl who watches her mom suitcase which has lots of saris and she desires to dress up like her mom. 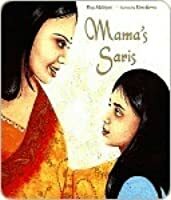 On her birthday, her mom dresses her u "Mama's saris' is a very interesting book which reminds most of the Indians about their festive season or their culture. This book can be used in elementary level for discussion about different types of clothes people wear in India and women wear sari's. The book is very colorful and has detail text which weaves you into the story. This story is about a young girl who watches her mom suitcase which has lots of saris and she desires to dress up like her mom. On her birthday, her mom dresses her up in a blue gorgeous sari. She feels all grown up like her mom in the sari. The pleasure of feeling all grown up even for a day reminds every girl to play dress up like her.The illustrations in the story are awesome and the story captures your attention.This story offers children to think about and enhances the children's interest about the story. I really enjoyed this book and found its content to be enriching and the language used was very good. The Author Pooja Makhijani uses hindi words throughout the story which I thought was an amazing addiction, it gave another aspect of this culture then what is seen on the surface. Overall it was just a simple sweet book that was able to meet its goal. For a classroom use I think this book would be a great addition for story time or for students to read on their own. It gives another element to u I really enjoyed this book and found its content to be enriching and the language used was very good. The Author Pooja Makhijani uses hindi words throughout the story which I thought was an amazing addiction, it gave another aspect of this culture then what is seen on the surface. Overall it was just a simple sweet book that was able to meet its goal. A sweet story about a seven year old birthday girl and her fascination with her mother's saris. She remembers in vivid and colorful detail the events where her mother wore each sari, except for one. As she recalls each sari and each special event, she begs her mother to let her wear one of the colorful fabrics to celebrate her own special occasion, her birthday. This story is simple to read and understand for young readers, and includes an array of color related words and adjectives. The book inc A sweet story about a seven year old birthday girl and her fascination with her mother's saris. She remembers in vivid and colorful detail the events where her mother wore each sari, except for one. As she recalls each sari and each special event, she begs her mother to let her wear one of the colorful fabrics to celebrate her own special occasion, her birthday. This story is simple to read and understand for young readers, and includes an array of color related words and adjectives. The book includes a helpful introduction and a useful glossary of terms (didi, Diwali, bindi, etc). This story will appeal to children ages 4-9. Another oh so beautiful book. A young girl is hanging out with her mother as she gets dressed in a sari for a special occasion, the girl's birthday. As they goes through the collection of saris, they reminisce about the events associated with each one. Like most young girls, the child wants to be grown up like her mother. It would pair up beautifully with Deep in the Sahara, a tale about a young girl who wants to wear the malafa. Both are visually stunning books. This book highlights a young girl who begs her mom to let her wear a sari on her 7th birthday since she is so "grown up". We read this just a few days after my own daughter turned 7. She loves to dress up in my shoes, especially, and sometimes my clothes. We really enjoyed the illustrations, and my girls had lots of questions about the saris (I don't think they've ever seen one) and the bindi. I appreciated the glossary/author's note at the end. Wrapped in crimson, green and gold, this warmly worded and richly illustrated account of motherly love shares a glimpse of the caring and compromise that can make minutes meaningful. I recommend this book from children ages 4-9. I do recommend this book for many girls and parents that looks up to their mom and loves to dress up with their moms clothes.This is a good book for readers to understand about relationships between a mother an daughter. Also if readers like to learn about different culture and tradition this is a good book to read.This book is good for young readers to understand and enjoy the illustrations. This book is about a girl who loves her mama's saris. Her mama tells her stories about when she wore the saris and the girl hope to wear one. In the end mama dresses her daughter in a Sari. It is sweet book about the relationship between a mom and daughter. I like this book for how it presents culture with intelligence, respect, and without commentary. It's refreshing to have a children's book show so much culture without pointing out that it is doing so. Loved this tale of a girl who loves watching her mama take out her special saris, and begs her mother to let her wear one for her birthday. Gorgeous illustrations (though I agree with other reviewers that the girl looks to be about 9 or 10 rather than 7) really bring the tale to life. Sweet ending. I enjoyed the story and the universal theme of dressing up like mama. However, the story didn't grab me and the illustrations seemed more poised. Maybe it's just me. I was never one for dressing up. a sweet book about a little girl wanting to grow up and be like her mother - and wear saris. The illustrations are lovely - a perfect book to share. I am the editor of Under Her Skin: How Girls Experience Race in America (Seal Press), an anthology of essays by women that explores the complex ways in which race shapes American lives and families. I am also the author of Mama’s Saris (Little Brown Books for Young Readers), a picture book. My bylines have appeared in The New York Times, The Village Voice, The Washington Post, NPR, Real Simple, The I am the editor of Under Her Skin: How Girls Experience Race in America (Seal Press), an anthology of essays by women that explores the complex ways in which race shapes American lives and families. 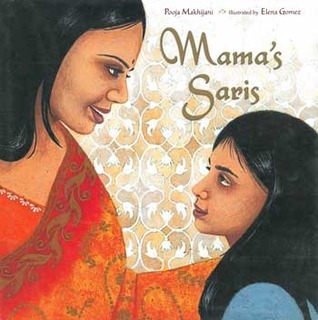 I am also the author of Mama’s Saris (Little Brown Books for Young Readers), a picture book. My bylines have appeared in The New York Times, The Village Voice, The Washington Post, NPR, Real Simple, The Atlantic, WSJ.com, Teen Vogue, VICE, Pacific Standard, Bon Appétit, Saveur, BuzzFeed, CityLab, and espnW among others. My essays and short fiction have been published in a number of children’s literary magazines, including Cicada, Kahani, and New Moon. Full time, I am a communications manager at Princeton University, where I manage internal and external communications and media relations, and write and edit print and electronic publications. I hold a B.S. from Johns Hopkins University and an M.F.A. in creative writing from Sarah Lawrence College, and been in residence at SPACE on Ryder Farm. I am represented by Saba Sulaiman at Talcott Notch Literary.